Third Window Films have always tried hard to bring a wide variety of films from the Far East to the West, from big studio productions to minor indie masterpieces, and this project is another step in our goal to open up the West to what's so great about Asian cinema! This project, hopefully the first of many (depending on the success of this kickstarter campaign! 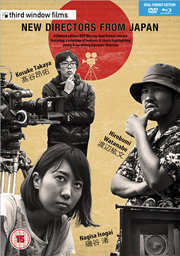 ), is focusing on young and unique directors from Japan whose films have not received any sort of distribution in their own or any other territory. We want to focus on supporting young talent and making their names recognisable so decided to create this 'NEW DIRECTORS FROM JAPAN' release which focuses on individual directors and their work. This release will be a limited edition set of only 1,000 copies. To cover both our blu-ray and DVD customers, the release will be a DUAL FORMAT release and include BOTH a BLU-RAY and a DVD of the films, as well as a separate extras disc (on DVD) which will include interviews with all the directors involved. This KICKSTARTER campaign is to setup the initial costs of creating this release. Due to the number of films, interviews as well as the fact that we are putting both a blu-ray and 2 dvds into the box with a slipcase it is a very expensive project, so we want to raise the initial funds by pre-selling the first 250 copies at £16 each (the retail price will be £22.99) and the added bonus of pre-ordering is that each of the 250 copies will be signed by all 3 directors! 3 Disc Limited Edition of 1,000 copies - Dual Format release with cardboard slipcase. Heavily pregnant Hatsumi and her sister Chika visit a shrine to pray for a safe birth, but in a tragic turn of events, Hatsumi tumbles down the stairs and loses the baby. What terrible secrets are hidden from their past and what lies ahead for these two? Saori, a school girl, is molested on the notorious "molester train" of the Hanagawa line and rescued by another school girl who witnesses the act. The girl who rescues her turned out to be a new student of Yamashiro Gakuen high school, which Saori also attends. The mysterious new student Yuriko, is rumoured to be a "parent killer". Yuriko then leads Saori and her friends to hunt molesters. Confronting their own desires, they go out of control. After a shocking encounter and separation between the two high school girls, their desires never to meet and reconcile, like train tracks never to cross. Those desires lead to a horrific end. Hirobumi Watanabe’s feature debut was made by a crew of four & their families & friends on a budget of less than £3,000! Takashi (Kiyo Shibukawa from Blue Spring), 36 years old and unemployed, is completely aimless. He lives with his grandmother, repeating the same routine - game center, bowling center, watching TV - day after day. This suddenly changes when Yuka shows up, claiming to be his half-sister. Confronted with a new situation, Takashi finally makes a decision. Whether it is a good one, remains to be seen. Debut Film: BUY BLING, GET ONE FREE! After being dumped by his girlfriend while on a date Kamono Naoto gets really down. ‘What’s wrong with my fashion?’ he wonders as he’s told off for being embarrassingly over-the-top with his see-through jacket, feather shorts and patterned pantyhose. Nobody understands his fashion. Neither his friends nor even a writer for a fashion magazine he likes. VIPO operates ndjc were commissioned by the Agency for Cultural Affairs as part of its policy to promote Japanese film and film-making. The project focuses on talented young film-makers to give them the real film-making skills through workshops, imparting the necessary knowledge and techniques to polish their film-making techniques and creativity. The long-term goal is to discover and foster the next generation of feature-length film directors. Since 2006 to 2013, there have been a total of 43 film-makers.